According to the study, which counted on the support from Torres Family, from Vilafranca del Penedès, the ecological viticulture increases the abundance and amount of species of farmland birds, and favours the insectivore bird populations that help the natural control of plagues in ecological crops. This agricultural practise helps improving the resilience of farmland birds –which are especially sensitive to environmental changes- towards the effects of global warming. Changes in agricultural production systems –from traditional to intensive- generated several environmental impacts on the environment, such as the loss of biodiversity. At the moment, intensive agricultural exploitation in Europe caused the loss of millions of farmland birds, which are also affected by global change. The beneficial effects of the ecological crops of vineyards on several organisms were known from years ago. “However –says Àlex Rollan, first author of the study-, there wasn’t much information on their real impact in the community of farmland birds”. In this context, from 2014 to 2015, UB-IRBio experts created bird censuses in a total of thirty-three vineyard parcels –designation of Origin Penedès- to see how the practice of ecological agriculture affected the community of farmland birds –insectivore ones mostly- and the most vulnerable species to climate change. 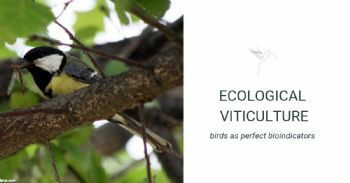 The new study describes for the first time the positive impact of the ecological viticulture on the abundance and amount of species of insectivore birds in the Mediterranean vineyards. The presence of herbaceous cover –a growing practice in European vineyards- has a beneficial effect on insectivore birds, in particular in spring and other seasons when people work on ecological crops, according to the study carried out by the Conservation Biology Group (UB-IRBio).